Motorcyclists are particularly vulnerable at junctions and accidents at T-junctions occur frequently. 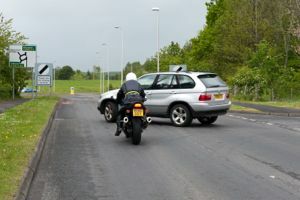 Many motorists fail to see an approaching motorcyclist and research has shown that many car drivers have difficulty judging the speed of a motorcycle and, as a result, underestimate the motorcycle's time of arrival. Always remember that in a collision with a larger vehicle, a motorcycle will come off worse. Always ride defensively. At junctions, attempt to get eye contact with the driver emerging from a minor road onto a major road. Think about how visible you are to others. Consider how you would deal with a vehicle emerging unexpectedly into your path. Please have a look at the decisions below in relation to junctions. Remember, no two cases are the same. Your case is unique, the accident circumstances are unique and each case is fact sensitive.